A boxing machine manufactured by DawPol, suitable for up to 6 players. The machine is simple to use - players simply press the start button and punch the bag! Up to 6 players can take turns, each punching the bag and trying to out-do each-others score. The machine measures the strength of the punch and displays the information. The machine can also be outfitted with a ticket dispenser, making it possible to award tickets to players based on the strength of their punch. The Boxer suits all individuals, small and large groups - and their durable build means that they could even be used for competition events. A boxing machine manufactured by DawPol, suitable for up to 6 players. The machine is simple to use - players simply press the start button and punch the bag! Up to 6 players can take turns, each punching the bag and trying to out-do each-others score. The machine measures the strength of the punch and displays the information. 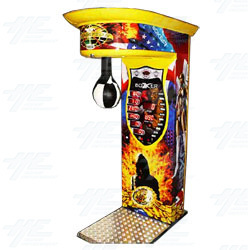 The machine can also be outfitted with a ticket dispenser, making it possible to award tickets to players based on the strength of their punch. The Boxer suits all individuals, small and large groups - and their durable build means that they could even be used for competition events.